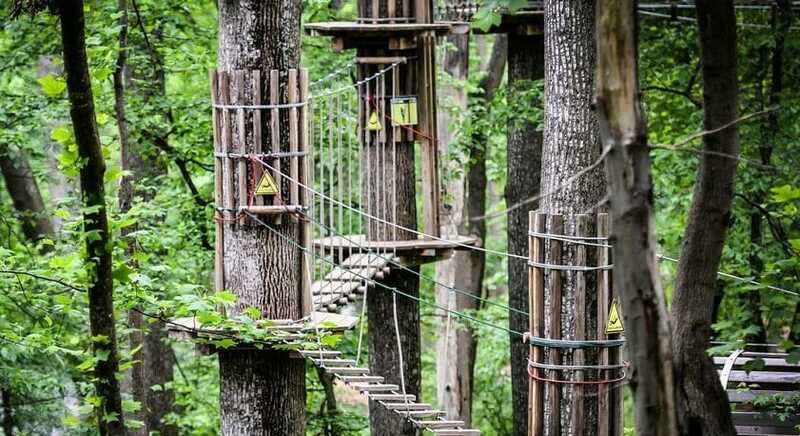 Go-Ape Treetop Adventure is located in Williamsburg, Virginia. The location offers several courses for student group participation. Students of all ages are welcome to swing on the trees! If there are younger children in the group, there is a Treetop Junior Course available. The group will be given harnesses, pulleys and carabiners. There will be safety training, and then the students are let loose into the forest canopy, free to swing in the trees. Instructors are always on hand if there are any questions. Specific features of the course include: 18 crossings and finishes, two awesome zip lines, and two loops. The first loop on the course contains a green hand rail which runs on one side of the crossings. The second loop on the course is more extreme and does not have the hand rail. The students will all go through the first loop but have a choice to go on to the second one. The group can do a total of three loops during the visit. If you have older students in the group, there is a course just for you! The students will be given harnesses, pulleys and carabiners. There is a 30-minute safety training session, and then they are let loose into the forest canopy. The course has five zip lines. There are obstacles throughout the course including: rope ladders, net bridges and Tarzan swings. Come bring your student group to take part in this fun tree swinging adventure!